Scientists this week have unveiled a brand new material that was inspired by nature and is thought to be the toughest, strongest ceramic-type material that has ever been made. This new invention was announced this week in the journal Science, by Robert Richie and his colleagues from the Lawrence Berkley National Laboratory in California in the United States. 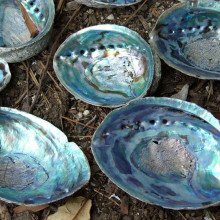 Their inspiration came from mother of pearl or nacre, the iridescent, shiny covering found on the inside of seashells, it's also the same stuff that pearls are made from. Essentially, mother of pearl is made from calcium carbonate, which in itself doesn't seem to be all that remarkable. But it is the arrangement of strong but brittle layers of calcium carbonate, interspersed with slippery organic layers that act like a lubricant and ultimately makes nacre three times tougher and less likely to shatter than normal calcium carbonate. These layers are also the key to the beautiful lustre of mother of pearl and pearls. And while scientists have for a while known the secret to these incredibly tough natural materials, until now, no-one has been able to artificially recreate them except in just very thin sheets of material. This new material isn't actually made form calcium carbonate, but from a mixture of aluminium oxide and plain old water. By mixing the two together then carefully freezing the mixture, the researchers were able to encourage the aluminium oxide to form sheets. Freeze drying the mixture then gets rid of the water leaving a scaffold of aluminium oxide into which a polymer is then added. This allowed Richie and his team to mimic the same interspersed layers that are found inside mother of pearl which are the secret to creating a material that is extremely strong but even if cracks start to form, they don't get bigger. The team think they should be able to further refine their super-tough ceramics, but making the structures even finer and closer to the actual structure of natural mother of pearl. Scientists have found another chemical involved in obesity - one that could hold promise for preventing diabetes. Writing in the journal Cell Metabolism, the researchers (and there's lots of them - from Louisiana state university, University of Alabama at Birmingham, Columbia University Medical Centre, and Cambridge University here in the UK), have identified the role of a protein called adropin, which plays an important role in digestion - regulating a group of genes which affect how energy is stored, including the production of lipids (fats) from carbohydrates that we eat. Adropin is coded for by a gene called Energy Homeostasis Associated (Enho) - a gene expressed in the in liver and in the brain. Expression of the gene itself if regulated by the amount of fat in the diet - mice on a very high fat diet showed a rapid increase in adropin, while fasting mice showed a reduction. This makes adropin one of the first factors shown to be directly related to the amount of fat in our diets, but there's a further twist to this tale. Obese mice, whether obese because of diet or genetics, don't produce adropin normally, but obese mice given extra adropin show less fat in their livers and respond better to insulin. These obese mice do eventually lose weight but the benefits, such as reduced liver fat, can be seen long before the weight is lost. As the gene for adropin is expressed in both the liver and the brain, it could well have some effect on the brain that we do not yet understand, so we still have a long way to go and this certainly isn't a quick fix for obesity or the associated diseases. However, as adropin seems to be instrumental in the homeostasis of glucose and lipids, it's certainly a candidate for further research. Back into the marine world once more, with a story this week that has provided the first robust evidence that sea turtles are more successful at producing young when females lay their eggs on beaches that are untouched by human hand. That's according to David Pike from the University of Sydney in Australia who published his study this week in the journal Biology Letters. They may spend the majority of their lives in the ocean, but female sea turtles are tied to the land and have to haul themselves out on beaches to lay their eggs. What Pike did was to hunt through hundreds of other studies published by people who have gone out and counted how many turtle eggs hatch on different types of beach - both those were people are present, with coastal developments like hotels and resorts, and beaches where there is no permanent human presence. 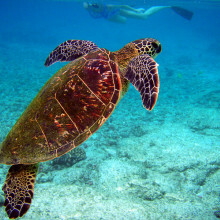 And what he found may not come as much of a surprise: for both the magnificent loggerhead turtles, and green turtles, on average around 12 to 16% more eggs hatched on undisturbed beaches compared to those on beaches with human developments on them. That may not sound like a lot, but this is likely to be an important difference for turtles that face a host of different threats to their survival, including being accidentally caught at sea in trawling nets and because turtles often mistake plastic bags for one of their favourite food: jellyfish. It is not clear exactly why the hatching success rate is so much lower on developed beaches, but it is likely to be a combination of factors including trampling and physical disturbance by people and various forms of pollution. This study has shown how crucial it is to protect nesting beaches that are currently not disturbed by coastal developments because there are the areas where many turtles are being born, and it is the young turtles that will determine the future of these wonderful species. When an epidemic looms, governments should stockpile vaccines. That's a no brainer, but what if you have little warning, or the cost or development times are prohibitive? Research in PloS Neglected Tropical Diseases suggests that a mere fraction of a vaccine may give enough short term immunity to stop an epidemic in it's tracks. 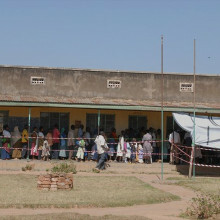 Looking at meningitis outbreaks in Sub-Saharan Africa, Phillipe Guerin and colleagues from institutions in Norway, Uganda and Manchester looked at the immune response of 750 healthy volunteers when they were given either a full dose of meningitis vaccine, one fifth of a dose or just one tenth. They measured immune response by looking at something called serum bactericidal activity, which does exactly what it says on the tin - a measure of how effective a blood sample is at killing bacteria. They took blood samples immediately before, then four weeks after vaccination, and tested them against 4 serotypes, subgroups of meningitis, called A, C, Y and W135. So how did the partial doses fair against a full dose? Well, of the 4 serotypes, a tenth dose of vaccine was as good as a full dose for types Y and W135. One fifth of the vaccine dose was enough for group A, but only the full vaccine dose gave an adequate serum bactericidal activity for group C.
Clearly, we shouldn't be stretching our resources beyond our limits, but in times of emergency, controlling vaccine dose in this way could allow us to protect many more people in the time available, and could be what we need to stop an epidemic in it's tracks. Helen - Now Professor Sunil Shah joins us now from the Midland Eye Institute. Hi Sunil. Thanks for joining us today. I thought we could start off with the very basics, just how do eyes actually work? Sunil - It's a way of focusing light onto the retina. If you think of the eye as a camera you have the cornea which is the clear window of the eye and the lens which both focus the light onto the retina which is a bit like the film in a camera. Helen - So we have this - the back of our eyes is where we're picking up the light. Now all sorts of things can go wrong with our eyesight and shortsightedness is when the image is focused in front of the retina long sightedness is when exactly behind the retina. How does that sort of thing change as we get older? Sunil - That's a condition called presbyopia. What normally happens is that the lens in your eye actually changes in shape when you try and read. As you get older and typically that's about 45 or so the lens stops being able to react so well. Then you need to give it some assistance in terms of reading glasses. Helen - So it is really just the close-up reading that becomes a problem. For example, I'm shortsighted and I think Ben is as well. Does that mean that as I get older I'm going to become less shortsighted or I'm just going to become both short and long sighted at the same time? Sunil - No, that's a bit of a misconception. No there are two completely different mechanisms. To a distance you will remain shortsighted and you won't be able to see. But in addition you will have a reading problem. 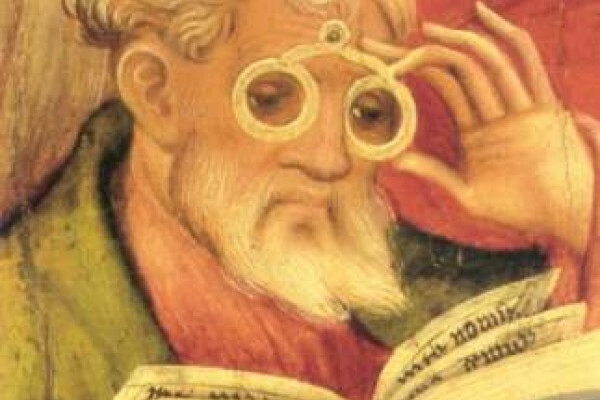 As it happens all that reading glasses do is make you artificially shortsighted. So if you were shortsighted to the right amount you might get a away with not wearing reading glasses but you still have a distance problem. Helen - So I'll have to keep an eye on it anyway. 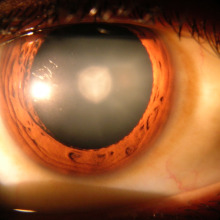 Moving now to cataracts: what are they and how do they develop? Sunil - Cataracts, we don't really know what causes them but everybody will get a cataract if they live long enough. There are many ideas on what causes them. One of them is related to sunlight exposure. Essentially a cataract is where the lens in the eye - so the lens is the size and shape of a smartie inside the eye - the lens actually becomes yellow and harder and this has an effect on the light getting through to the back of the eye. Helen - So it sort of seems like your vision becomes cloudy and more indistinct as you get older, is that right? Sunil - If you're developing cataract, yes. Helen - I take it that this is something that happens through time. Way back when we were all hunter-gatherers and so on we wouldn't live long enough really for cataracts to happen. If they did you'd be less likely to survive perhaps but not many of us are thankfully living much longer and so cataracts are presumably becoming a problem. Sunil - Absolutely and also in the third world because there they do tend to develop a little bit earlier and there's still a lot of places where there is an adequate provision of treatment for it. Helen - We can treat cataracts. 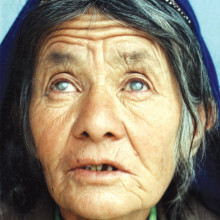 What can we do to help people who have developed cataracts? Sunil - This needs an operation and the lenses inside the eye are the cataracts and so it does need a full operation. Lots of people we see think we can do the surgery with a laser but that's not really the case. What we do is create a small hole and the hole's are between two and 3mm large and. We remove the contract from inside the eye. In the space where the contract would have gone we put a plastic lens in its place. Helen - So you take the whole lens out? Sunil - Well, we - it's a little bit more complicated than that. If we go back to the smartie analogy what we actually do is you break open the candy coating on the outside and remove all chocolate. In the candy coating we put in the plastic lens. Helen so you squirt that back in. Sunil - Well, it's a solid lens. We can either roll it or fold it. It goes in through the same 3mm hole. Helen - Once you've done that that's all that you need to do. That's a one-off operation and they have much better vision for the rest of their lives. Helen - Replacing lenses to cure cataracts, that's one thing. Is there anything else we can use the surgery for? Sunil - Well, we use lens surgery instead of laser surgery and in people who want to get rid of their short-sightedness as well or their long-sightedness. It's not a procedure you'd choose for somebody who's younger. you can organise a small prescription but certainly there are indications for it. For example, some while ago I treated someone whose prescription was -27. Helen - Goodness me. That's enormous! Sunil - Yeah. Most people think they're pretty bad when they're minus two because they can't see the top letter on the charts. But if you think this person was ten time as bad. Ben - Replacing the lens for the same reason that you have laser eye surgery. Later on in the show we have a package about laser eye surgery. One of the things they told me is that if your eyes are going to change over the next 5 or 10 years anyway then laser eye surgery won't stop that from happening. Would lens replacement surgery mean the further degradation of it won't happen? Sunil - In general most people's prescription doesn't change after their early 20s. So if you've got evidence of no change over a number of years it's actually extremely unlikely they'll change after that time. Certainly that's why the College of Ophthalmologists recommend that though we do not do laser eye surgery until someone's 21. You have to take each person on what the prescription is, what the state of their eye is, what their requirements in terms of job and hobbies are before you decide to operate on them. Paul - It's good for our eyes because the surface of your eye needs to have moisture on it to keep the cells healthy. They add little nutrients to the cells. They provide oxygen to the eye and they also provide a nice smooth optical surface. That helps us see nice and clearly. Meera - how does that happen when we blink? How is the health of our eye maintained? Paul - There are different parts of our tears. there is a little bit at the bottom which is like a mucus layer. That comes from the little cells in your eye. They secrete that all the time. That helps the tears stick to the eye. Then you have a watery bit that comes from glands tucked up under your eyelid. They're secreeted gradually all the time. That adds the watery bits. When your eyes are watering those cells are being squeezed and more water's coming out. We've also got an oily layer at the top to help two things. They help tears spread each time we blink. The blinking squeezes all the tears down and then they have to spread back out and that oily layer makes that easier. They also stop the evaporation. You want your tears to stay there and you don't want them to wash away or evaporate away. That evaporation is part of the secret of what we think is going on with blinking. If you keep your eyes open for too long it hurts. Everyone has staring competitions but that hurts if you keep your eyes open for too long. So you need to blink before that happens. You don't want to spend your life blinking so there must be somewhere in the balance between the two. If you have evaporating coming off with the tears even with that oily layer there, that's producing temperature change and maybe a localised temperature change. The evaporation isn't always equal in the different places it's happening. We've got a thermal energy camera. Meera - Actually yes. We've got one here with us. it's playing a recording of one of the visitors here today blinking. You can see what the temperatures are for all the various regions of the eye. Paul - yes that's right. You can see the different temperatures of the eye. We've got hot and cold temperatures represented by different colours. The central part of the eye, the clear cornea that we're all seeing through has no blood vessels. That's important. It can't have blood vessels otherwise you couldn't see through them. That's a bit colder, it doesn't have the blood supply heating that. The tears are formed by the eyelids and also warmed by the body as they're being produced. Each time we blink those warm tears are spread back over the eye. When you keep the eye open you're evaporating the tears slowly. Once they're over that colder, central part you get the temperature change going on. These really sensitive corneal nerves can detect that temperature change. Out of that temperature change the cornea says, right, we've got a temperature change going on. That's sent to the blink centre of your brain and triggers another blink. The whole thing starts again. Meera - Does the composition of our tear films vary greatly throughout the general public? Paul - Yes. We're all different, aren't we? We're all the same but we're all different. From an overall point of view we're supposed to blink maybe ten or twelve times a minute. Some of us blink more. Some of us blink less. That's partly due to the tear film. Some of us have better quality tear film. Some of us poor quality tear film. Similarly, looking at that is actually just to take a little tear sample. Put it in a glass slide. Allow it to dry there for ten minutes. It forms this beautiful crystal pattern. If it's a cold winter's morning and you look at the crystals on the windscreen of the car or something like that. It's that kind of thing that you're looking at. If you've properly balanced tear film you've a beautifully, neatly-packed, tight, small furling pattern that looks really regular and neat and tidy. If you start to have an imbalance where there's not enough salts or there's too much or there's too many proteins or that mixture's wrong the pattern changes quite dramatically. It's a really easy way for us to start judging quality of tear film. Meera - Having looked at this in a patient's eye would you then be able to tailor eye drops more specifically to what their eye needs? Paul - Yes. That's what's starting to happen. The manufacturers of all these drugs and drops have begun to look at these issues. Now there are quite a number of drops out there. We're still only at the beginning of this, unfortunately. We're still trying to find the correct mixture. That's what we're hoping our work will do to try and answer some of those questions. Ben - Hi, Robin. First of all, what is inherited retinal degeneration? Robin - It's a diverse group of conditions caused by defects in any one of 150 different genes. They give rise to deterioration of vision very early in life. It may result in almost absent vision or it may affect individuals in early adulthood or middle age. Whatever the gene defect the result is the loss of receptor cells through apoptopic cell death and further deterioration of vision. Ben - Is this a bit like AMD where we lose a particular region of the retina. In particular with AMD we lose our central vision so our peripheral vision is still good but we lose the really important, high-detail bit in the middle. Is inherited retinal degeneration the same or is it a bit more broad? Robin - It's much broader than that because there are at least 150 different forms of inherited retinal degeneration. Some forms - and again it's a group of conditions - called retinisis pigmentosa have defects in genes that affect primarily the rod photoreceptor cell. 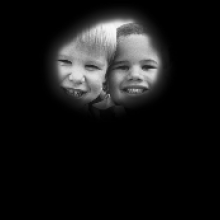 The patients experience a loss of nightvision and peripheral vision. Often because of the deterioration of their rods their cones start to degenerate later in life. They then start to lose central vision. In other types of inherited retinal degeneration caused by defects in genes that function in cone photoreceptor cells the central vision isn't affected. The condition might resemble the sort of vision loss one would experience in age-related macular degeneration. The cause is quite different but it would be the loss of that central high-definition vision. Ben - I see. Just to clarify - the rod cells are the ones we use for night vision. They see really in black and white. Robin - In different light. 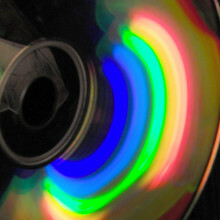 They don't perceive colour and one uses rod vision in the periphery. Ben - And the cone cells are the ones that pick up our full tricolour vision. They're more focussed in the macular, the high-detail area. Robin - Yes, for reading and recognising faces. That's all tone-mediated vision. Ben - You've mentioned that there are 150 different genes for 150 different types. How have we found the genes? How do we know which genes are going wrong? Robin - It's been a huge challenge and you will be aware that the genome project and human genome project was important for the central identification of thousands of disease-causing genes. Essentially it starts with identifying a family that's affected and pedigreed mapping of the genes through crucial genetics and then using molecular genetics to hone down the region to a molecular level. And then, eventually when some candidate genes are found proving that they're the lead-causing and often demonstrating that through production of an animal model that's defective in that particular gene. Ben - So, for example a knock-out mouse. Ben - So we know what genes are causing the problem, can we treat it? Robin - Well we're starting to make major advances in developing treatments. I have to stress at this point there is no effective treatment for inherited retinal degeneration but my group's been involved ver the last 15 years in developing gene therapy for these sets of conditions. Earlier this year we published the first set of results from a clinical trial of gene therapy from one particular form of inherited retinal degeneration. The results were encouraging and were built on the work of the last decade showing that we could improve vision and slow degeneration in a variety of animal models. But this time earlier this year we showed that we could use the same technology to improve vision in patients. Ben - Fantastic. Is this using a retrovirus? Robin - It's not using a retrovirus. It's using a viral vector but it's using a vector based on a virus called adeno-associated virus, which is a different type of virus which is essentially a nonpathogenic palmar virus that is very common in humans. It's not known to be associated with any disease and we've engineered the virus to carry the missing gene and put that gene back into cells of the retina. Ben - So this has to be applied directly to the retina. You can't give this systemically and just hope that it gets taken in to the right place and the gene is expressed in the retina. Robin - The vector is administered through a quite complex surgical procedure that localises the viral suspension very precisely between two layers of cells in the retina. Between the photorecoptor cells and the retinal epithelia. In this particular condition the gene defect is in the gene that is expressed normally in the retinal epithelium. We target the virus to that cell there. The virus is taken up by the cells and the gene expressed in the cells and produces the normal gene product in that cell. Ben - It sounds incredibly promising. Do you think you're likely to have similar gene therapies for other diseases in the retinal degeneration spectrum or things like advanced age-related macular degeneration? Robin - Well I think the technology is certainly very promising. It's taken us fifteen years to move from the bench into the clinic. We expect that the next disorders that we'll treat we'll be able to do so much more rapidly. The time for development is going to be diminishing just because we've learnt so much more about the safety profile and the technology that's required for efficient gene delivery to the eye. We have now a programme that includes the development of gene therapy. Not only for the disorder we're treating at the moment which is a type of Leber's congenital amaurosis due to a defect in RP65. But we're looking at three or four other rare inherited disorders as well as developing a gene therapy approach for age-related macular degeneration. For AMD we had to take a slightly different approach. The approach would involve replacing defective gene but using a gene therapy vector as a way of delivering a medicinal product. Instead of having to use repeated injections of an antibody to target blood vessels growing in the retina we might be able to use a gene therapy vector to deliver a gene that will have the same result. The advantage of that is a single administration. Ben - I've no doubt that multiple injections into the eyeball will make quite a lot of our listeners quite squeamish. Reena - The cornea is made up of three layers. There's the epithelium layer, then we have the stroma which forms the core of the cornea. And the endothelium which is a single layer of cells which provide the nutrients to the cornea. It's mainly made of collagen. The stroma is, anyway. Ben - So it's a collagen structure but we can reshape it using lasers. How do the lasers actually reshape it? Reena - They, basically by removing small amounts of tissue. If you were to imagine the cornea as being like a wood - imagine changing the shape of the wood so it's the same sort of thing. All the laser does is cause a small change in shape of the cornea and those small changes in shape can actually give a big change in the refractive power of the eye. Contrary to common belief 2/3 f the power of our eye is actually from the cornea and not from our lens. We can actually do quite a bit by changing the power of the cornea. Ben - I know that there are a few different types of laser eye surgery. What are the different kinds? Reena - Essentially there's two basic types of laser treatment. First of all is the lasik which is spelled with an 'i-k' and the other one sounds exactly the same but is spelled with and 'e-k' - Lasek. The difference between the two is just the surgical procedure's slightly different. With the lasik, if we were just to imagine our cornea as being made up, say of 100 sheets of paper you can think of it as what we're going to do is lift the top ten sheets, do the laser treatment underneath and then put those top ten sheets back again. With the lasek - if we imagine the hundred sheets again we'll remove the very top layer, do the laser treatment underneath that and the top layer regenerates. The main difference between these two is in the initial recovery period. Lasik is the one with the faster recovery. Most people are driving standard to better the next day whereas lasek is roughly a week or so behind. Ben - Why can't you just operate with the laser directly on the surface? Reena - The top layer of our eyes is the epithelium which is like a skin layer so if you laser on top it will just grow back again. Ben - Is everybody suitable? Can everyone have laser eye surgery? Reena - Unfortunately not which is why we do the consultations. Most people are suitable. We have to turn away about 15% of patients who do come and see us unfortunately. It could be a number of things. It could be general health which is a contraindication. It could be the corneas are too thin, it could be the corneas are too steep, too flat. There's a number of reasons. Ben - What are the risks? Reena - The worst case scenario is an eye infection but that's quite rare. You have the same risk factor every time you put a contact lens in your eye. The most common question I get asked is 'has anyone gone blind from this procedure?' And we haven't had anyone that's lost their sight. If we're thinking about the anatomy of the eye itself you can see why. You rule out a lot of the complications because you don't enter the eye to do the treatment. The treatment is very superficial. You're lasering the cornea. Ben - Once you've had the surgery how long does it last? Reena - The treatment itself is permanent. The way your eyes change is individual to yourself. If you didn't have treatment and five years down the line your prescription was going to change by + or -1 for example, this change can still take place. What the treatment does do is it corrects you at this moment in time with the prescription you have now. If your eyes are going to change they're going to do so regardless. A good indication that you're going to be stable after treatment is how stable you are beforehand. If your prescription's been stable for the last 5-10 years then that's a good indication it should be afterwards. Ben - I've just had a consultation with you. Can you take me through the different stages and what we had to do? Most of it was very similar to a normal eye consultation. Reena - That's correct. We have your prescription. We check the health of your eye. We go through your history and symptoms so we know more about your general health. We look at the front surface of your eye, the cornea, the lens and your retina. These are all the things they'd do in a normal eye test as well. Then you had a session where you did some scans. We looked at the front surface of your eye. We mapped your cornea, corneal topography and then we measured your aberrations, how much glare you suffer from. Ben - I have my scans here and how do I look? Can you tell me what these actually mean? Reena - First of all if we have a look at the orb scans which is a topography map. First of all, is looking at how steep or flat your cornea is. Yours if perfectly within the normal scale. Having a look at your corneal thickness map your corneas are nice and thick which is fantastic when it comes to laser treatment. Ben - Map is really the right word. It genuinely looks like a map of hills or mountains and lakes. Reena - Yes, it does! Ben - So that's the orb scan showing the topography of my cornea. What's the other scan that they did? Reena - The other scan is the aberrometer. That measures how much glare you suffer from. If you imagine this as being a pinpoint of light what we have here is a picture of how your eye scatters the light in different directions. Ben - What this should really be is one solid pinpoint of light. It actually looks like a crystal. It's triangular, lines inside it: like you would on a diamond. Reena - It does. Everyone has a different map depending on how much aberrations and how much aberrations you have. Ben - Putting all of this together, looking at my prescription and the thickness and shape of my cornea am I eligible, could I have laser eye surgery? Reena - Yes, you are suitable to have the treatment done. Ben - What's the cornea actually made of? 44:34 - Why do we laugh when we find something funny? Why do we laugh when we find something funny? Why do we laugh at something that's funny? Something that's funny is by definition something that makes us laugh. I'll talk about why we laugh. Laughter is really a social phenomenon. 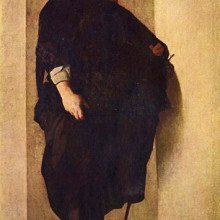 If we look back to its origins, laughter, the 'ha ha' originated in the 'pant pant' of rough and tumble play such as you would find in tickle or the rough and tumble play of children. 'Pant pant' became the human 'ha ha.' With adults, however the arena of laughter has shifted from tickle and rough and tumble to a more linguistic and cognitive arena whereby, for example, the play of adults has to do with wordplay during conversations. You don't have to tickle one of your colleagues to get them to laugh. You can tell them the joke. Even within conversation the key to laughter is the presence of another person. Laughter almost totally disappears when we're alone. The key element for producing laughter is another person and not a joke. In fact we have followed people around and recorded what was said before people laugh. In only 10 or 15% is it anything remotely joke-like. Most laughter follows comments like 'hey, where have you been? Ha ha!' or 'I've gotta go now, haha!' These aren't jokes so it basically is about developing bonds and relationships with other people. 53:11 - Is there a downside to having a cataract removed? Is there a downside to having a cataract removed? Robin Ali: Cataracts are very common in patients with RP and that's probably because their retina is thinner and there's less oxygen consumption. That extra oxygen generates free radicals and damages the lens. In general there's no downside to having the cataract removed. It's very important for individuals to seek appropriate consultation with an ophthalmologist. 53:59 - How long will a cataract operation last before it starts to grow back again? How long will a cataract operation last before it starts to grow back again? 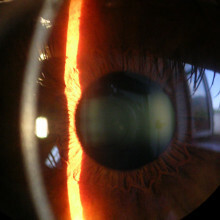 Sunil - Cataract operations are a one-off procedure. A cataract can't come back in itself. Even children who are born with cataracts, once they've had their cataract operations done they'd expect to live without a cataract for the next 80 years. The only thing that can happen is you can get some clouding of the membrane holding the implant. Some people call that an after cataract but that can easily be laser away without the need of another operation.